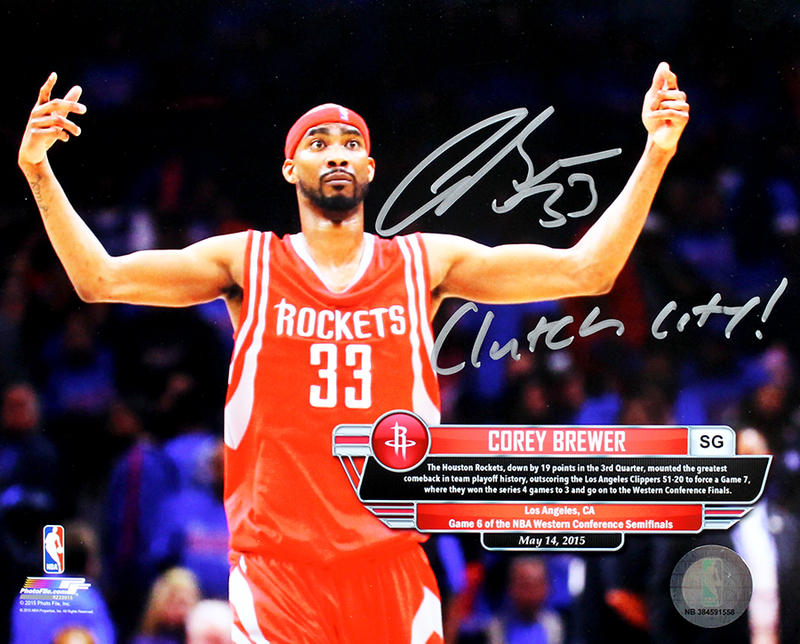 Home > Basketball > Corey Brewer Autographed Houston Rockets 8x10 Photo Inscribed Clutch City! Corey Brewer joined the Houston Rockets in December of 2014. He was one of the key members in the Rockets' success last season, helping them to the Western Conference Finals, but ultimately losing to the 2015 Finals Champion Golden State Warriors. This Houston Rockets 8x10 photo picturing Brewer after making a shot in Game 6 of the Western Conference Semifinals has been hand signed and inscribed "Clutch City!" by Corey Brewer. Each autograph is guaranteed authentic, and includes an individually numbered TRISTAR Authentic hologram.